A superb deal and classy library for any producer needing extra analogue drums and effects. Classy and organic sound sample generators. A highly useable collection with a few quirky sounds thrown in. A steal at this price! There's nothing like the sound of transistors and the hands-on feel of putting cables in sockets. Roger Grønberg, the force behind Native Instruments' Raw Voltage, knows this and has devised Raw Voltage, a library for Maschine that taps into the power of his unique modular synthesiser system. Built using esoteric modules from manufacturers such as Modcan, Oakley and Encore, as well as classic synths from ARP and Korg, it's a set-up to make any laptop producer drool. Raw Voltage is available as a download from the NI website. Presented as a folder, it contains 450MB of audio, kit and project files - there are 44 unique kits and over 1400 samples. All sounds are presented as .wav files so you can load them into the sampler or DAW of your choosing. "There's no shortage of imagination in their sound design"
Raw Voltage has a wide range of kits and a wealth of effects that could only come from the modular analogue world. Nearly every sound is useable but the kicks and snares stand out. 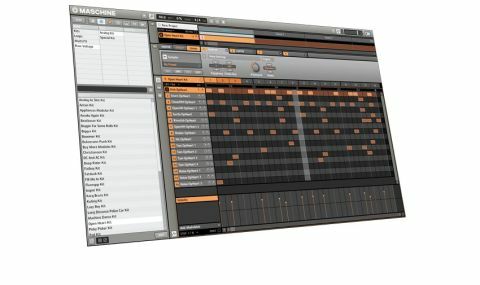 Suited to modern styles such as Dubstep and Tech House, they could make a refreshing alternative to the Vengeance drum kits ubiquitous in 2012. There's no shortage of imagination in their sound design, either. Most analogue kick drums use a sine wave sweep down that mimics the decay of a vibrating drum skin. With Kick DCAC we have the opposite; a slight sweep up in pitch that's both odd and compelling. It's unsettling at first, but stick it through a club PA and you have a ready made hook right there in the kick drum. Kick Policecar 2 is another highlight with its simple low end thud resembling a TR-808 kick but with extra warmth and depth for laid-back styles. The snares are resolutely analogue but go well beyond the typical TR-808 or TR-909 variations found in other collections. Buksevann R1 is clicky and thumpy, making it ideal for Minimal House and Wetset 1. With its filter sweep and lighter touch, it would sit well in many an electronica mix. It may seem strange to say about a collection so resolutely electronic, but the most striking thing about these drum sounds is how natural they sound. Whereas some collections suffer from the designers bullying the sounds through aggressive processing, Raw Voltage feels 'right'. Most hits are open, fresh and sit well in the mix with no further treatment. Honourable mentions go to the supplied basses, leads and pads, all of which sound vibrant and lush (we'd love Grønberg to develop an extensive collection of these sounds for Kontakt). Raw Voltage is as high quality as a collection of sounds for Maschine can be. Plus, if you can't live without it at your side all day long there's a compact version for iMaschine too.